Houston was born in Ayrshire1891. 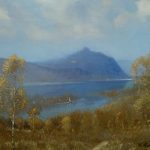 He studied at Glasgow School of Art, and was a painter in oils and watercolours of landscapes, specialising in coastal scenery and lochans and figurative subjects. 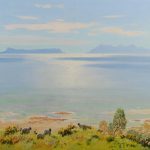 He painted in a powerful style, mainly landscapes of the west coast and western isles. He was also a noted aquatintist and designed and executed railway posters, which particularly suited his sense of design and use of solid colour. He was elected to membership of the Royal Scottish Society of Painters in Watercolours in 1936. 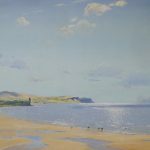 He exhibited widely, showing 6 works at the Royal Academy, 8 at the Royal Scottish Academy, 11 at the Royal Scottish Society of Painters in Watercolours, and 34 at the Royal Glasgow Institute of the Fine Arts.